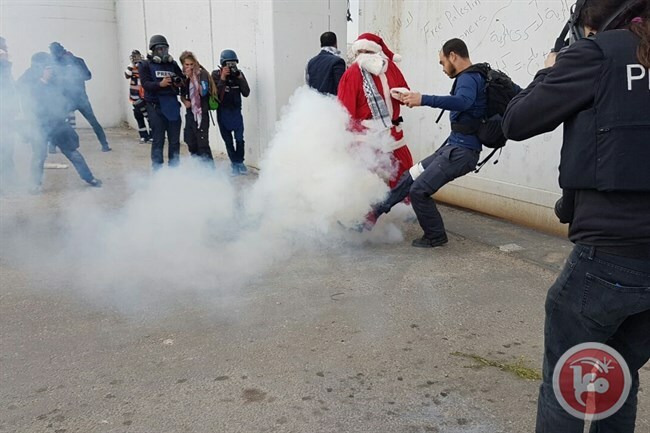 BETHLEHEM (Ma’an) — Israeli forces Friday suppressed Bethlehem’s “Santa Claus March,” shooting tear gas and rubber-coated steel bullets at participants, with many suffering from tear gas inhalation. 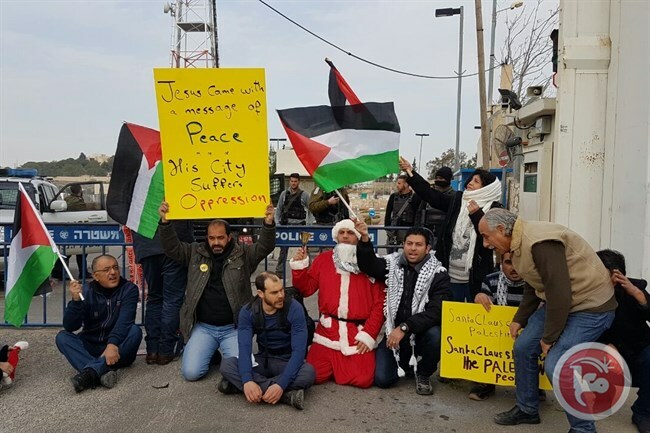 The march, which includes participants dressing up as Santa Claus close to the Christian holiday of Christmas, was launched under the banner “Terrorism and occupation are two sides of the same coin,” and demanded the opening of Israeli checkpoints for Christian tourists to celebrate the holiday in the birthplace of Jesus Christ. A Ma’an reporter witnessed Israeli forces fire rubber-coated steel bullets and tear gas into the crowd, which caused a number of participants to suffer tear gas inhalation. Five journalists were also injured, including the cameraman for the Jordanian al-Roya TV Muhammad Shoudha. Israeli forces reportedly fired tear gas canisters directly at his foot. This was the second such march to be organized this year in Bethlehem for the Christian holidays. Israeli-imposed restrictions on Palestinian movement, regulated by more than 196 illegal Israeli settlements scattered across Palestinian territory, more than a hundred Israeli checkpoints and physical obstacles, and the construction of the Israeli separation wall has continued to strain the movement of Palestinians and has caused the tourism industry to plummet. Christmas is typically a time of year where Bethlehem receives droves of Christian tourists visiting the Nativity Church in the Old City, however activists have pointed out that the tourism industry has severely declined, with Israeli authorities continuing to tighten control over Palestinian movement as the Israeli occupation now enters its 50th year.